Towards the end of this course I discovered an interest in watercolour painting and part of my investigations into the medium have led me to the artist Jean Haines, mostly because hers was one of the few books in our very small local library! The book in question is called Atmospheric Watercolours (Search Press, 2012). What immediately strikes me about Jean Haines style is that it is very loose with a lot of freedom rather than traditional, dark, landscapes which was how I rather naively thought of watercolour paintings. Jean has an adventurous use of colour, introducing colours that do not appear in the subject in nature but add drama and emotion to a painting. The painting below of her sheep shows a range of colours on the sheep bodies that would not exist in real life but give the work a huge vibrancy. This use of colour is something that can be translated into my textile work, throwing in colours to really make a piece of work come alive. 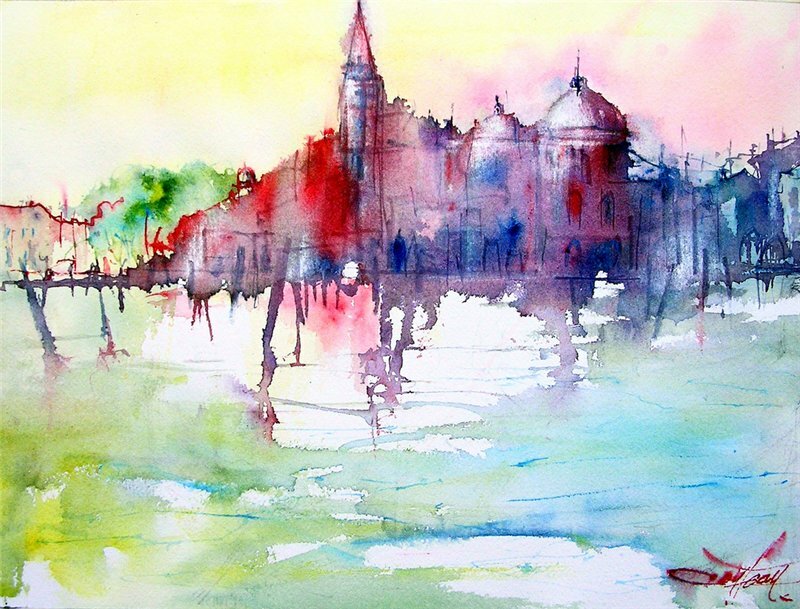 Also the painting of Venice below has very glowing, pure colours. 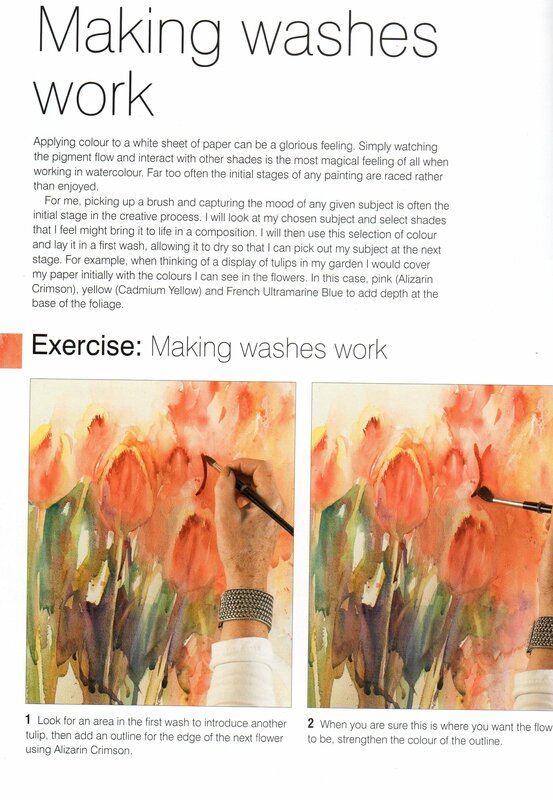 Referring back to the colour studies I did from David Hornung’s book Colour: A workshop for artists and designers, Jean uses a lot of prismatic colours, a broad range of hue and a broad range of value to create maximum impact. To introduce myself to Jean’s style and use of colour I decided to do some painting in watercolour myself, trying to achieve her sense of freedom. To begin with I tried her technique of painting a background first, and then picking out detail from the shapes that appear in that background. As it is Spring here we have just had Daffodil Day and I had some real flowers to use as a subject. I prepared a background with a central wash of yellow and peach colours, crumpling cling wrap on the top as it dried to form different patches of colour. A dark green area vaguely represents stems and the top right purple acts as a colour contrast. Once the background was dry, I picked out random daffodil shapes but tried to keep them blurred and married with the background. 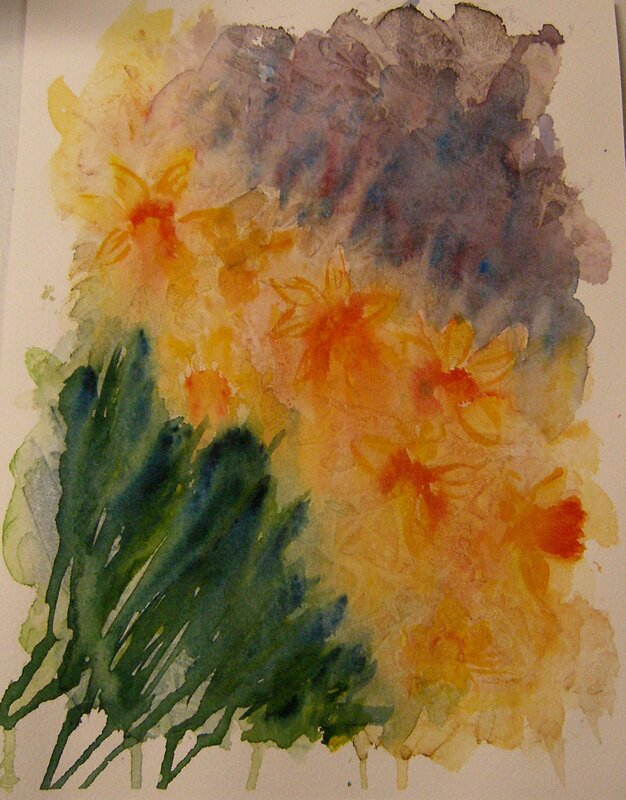 The result was quite good with the daffodils but I feel I covered too much of the paper with paint and needed to leave more white areas to counterfoil the colours. My colours are also not pure enough, probably because I am being too cautious with their usege which means I layer colours on top to add depth and this loses the clarity and vibrancy, leading to a certain muddiness. My next experiments were on the subject of whale sharks, an immense oceanic fish that appears in the waters off the coast between March and July each year and grows up to 8 metres in length. I have swum with one of these creatures and have an abiding memory of it looming up out of the dark waters as it moved by. 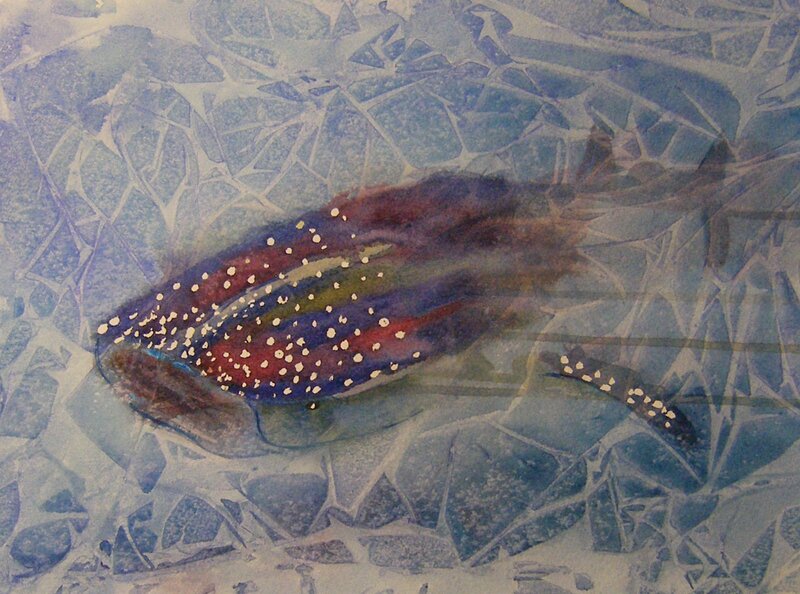 The first painting was to get the subject in place and experiment with creating a difference between the central image and the sea even though the colours were similar. This was achieved using the cling wrap technique for the sea. 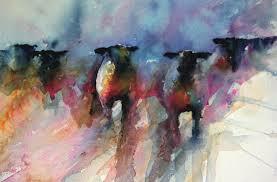 But I feel that the painting lacks punch and doesn’t have the colourful drama of Jean Haines’ work. 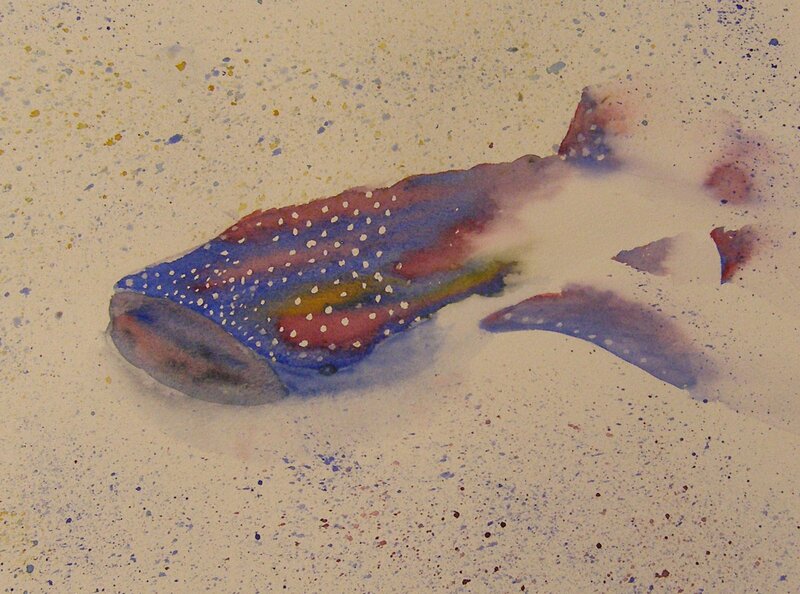 A second painting was more successful in introducing un-natural colours and adding much more vitality to the whale shark. I tried to get the idea of the back end of the whale shark disappearing into the dark sea. 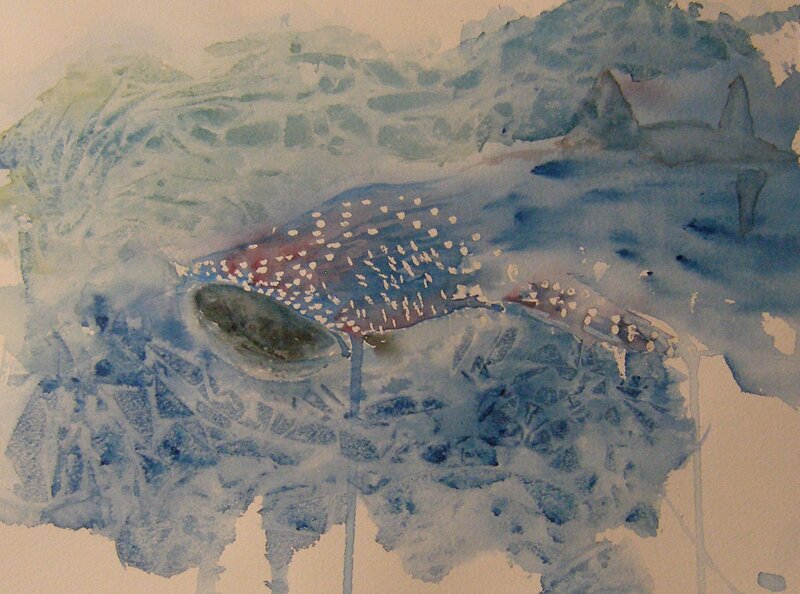 For my third whale shark I took the approach of not painting the whole creature and leaving more white paper showing. This was more successful in creating a central image with strong colours against a lighter background. I am improving in using stronger colours in my first washes to gain the clarity and avoid muddiness. The idea of creating an image and stopping just as it becomes recognisable is one that can be translated into other mediums and I can see this working particularly in techniques like applique. I also like the method of allowing the background to dictate the main image. 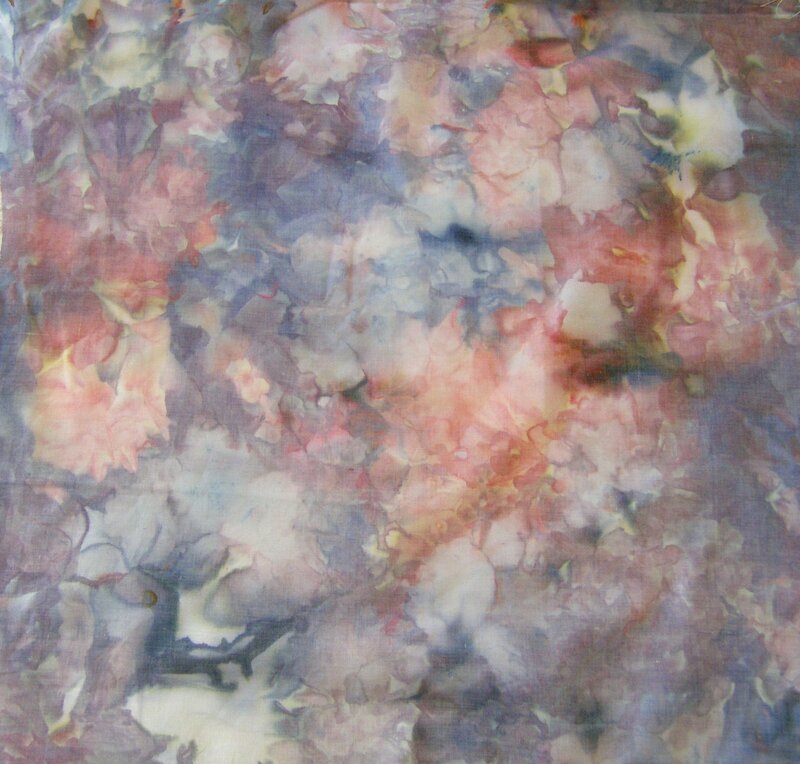 For example, the following piece of fabric which I ice dyed has definite floral patterns in it that could be picked out in stitch to create whole or partial flowers that merge into the rest of the background. 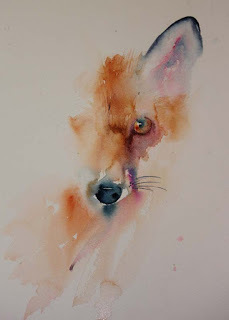 I have picked up a lot of ideas and inspiration for the use of colour, composition and the partial representation of forms from Jean Haines work which shows the benefit of looking at the work of artists across multiple disciplines.